We had a movement project in photography class, and I thought of going to the theater, I set the shutter speed on 30 seconds and directed my lens towards the audience while they were getting in. 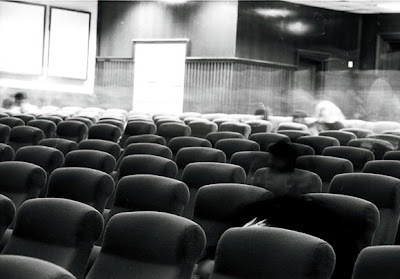 This room is actually full, but they appear as ghosts as they move. The only one was shown is the one who was sitting on the closest chair to me. There is a very common saying in Kuwait: "may god never changes our state", we usually say it when we're satisfied with our life. A second thought came to mind after being through a lot, that yes I have changed, but I am not regretting it! I have changed and I am still changing. I think the state I am explaining is perfectly demonstrated in this photo experiment. people don't like it when you change because they can't see clearly who you are, their relief is when you settle even if you're not doing a lot in the static state. In the static state -as in the photo: sitting- they can call you a name, you think it is yours, afterwards you realize -or not- that they call you with the number of your chair. Why it is shameful for a person to change his/her mind? it is natural. And humans are the paradoxical statement of nature. Unfortunately. Another insensible idiom of change, that it has a single critical point. A moment of either, or. Then in your whole life you have lived two states, I think he or she only changed their chair.